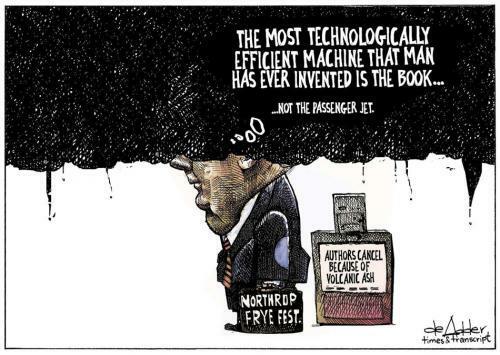 The editorial cartoon in this morning’s paper shows Frye in profile, very short legs,mostly all head, with a big double chin and the top half of the head covered in dark volcanic ash, and in the thought bubble the words “The most technologically efficient machine that man has ever invented is the book … not the passenger jet.” Frye’s just walking past a newspaper vending machine, and the headline on the newspaper is “Authors Cancel Because of Volcanic Ash.” The volcano’s still working for us, even as it’s causing tremendous hardship to so many. It’s definitely not a trade-off that we desire. We lost two authors to the volcano, as I mentioned yesterday, and last evening we lost a storyteller to the snow crab fishery. Apparently the crab fishery is in disarray this year, and Gilbert Sewell, Mi’kmag storyteller from the north of the province, who is also deeply involved in the fishery, was called to an emergency meeting at the exact moment he was to arrive in Moncton. Host Ronald Labelle, an experienced storyteller himself, filled in, and made some other adjustments, and the evening was great – everything we’d hoped. People are telling us we should have a storytelling event every year. One thing I noticed is that the English storytellers (Kay Stone and Ronald) stood front and centre on the stage and relied on their words and facial expressions to tell their stories, whereas the French storytellers preferred to sit on the stool that was provided and made great use of hand and arm gestures, and bodily movements, to tell their stories. They shaped their words and made us see what was happening. I wonder if this might be true more generally of English and French professional storytellers. But whether English or French, they kept us enthralled, for 3 hours! Today at noon the focus on storytelling will continue, at a roundtable on “Voyaging into the Unknown in Folk Tales and in Dreams.” The panelists include 3 experienced, professional storytellers, and one Jungian analyst, Craig Stephenson. Key Frye concepts, such as katabasis, descent, and labyrinth, will be shadowing the discussion, and perhaps there will be a way to bring them out more explicitly. At 4pm this afternoon two New Brunswick authors, Beth Powning and Robert Moore, will engage each other in conversation. Beth recently published the novel “The Sea Captain’s Wife,” to wide acclaim. Robert is one of the finest poets in this part of the world. They will begin the discussion by talking about the ‘place’ they go to when they are creating a work of art, whether a poem or a novel or a memoir. And how that (interior) place they go to is related to the place where they live. There’s lots more going on today – the YMCA Literacy Luncheon featuring guest speaker Guy Gavriel Kay, Dialogue in French with Gracia Couturier and Christiane Duchesne, Book Club in French with Martin Winckler, Café Underground featuring performances by high school students of their own written works, and many school visits. The authors almost always enjoy these school visits, even when things get a little confused sometimes. Apparently Guy Gavriel Kay’s school thought he was coming on Thursday instead of Tuesday, but some quick thinking made it all come out all right. With 30 authors, and probably close to 100 total classroom visits, it all goes amazingly smoothly, thanks to organizers Nancy Pipes (English) and Roxanne Richard (French). Today’s highlight, for me, will be 8pm this evening when Craig Stephenson presents a talk entitled “Reading Frye Reading Jung.” It looks like we may have a very good turn-out for this talk. In the audience will be Alberto Manguel, who has accompanied Craig on his trip. We – and they! – are hoping the ash cloud won’t prevent them from returning to France, sometime later this week. This entry was posted in Frye Festival on April 21, 2010 by Ed Lemond. 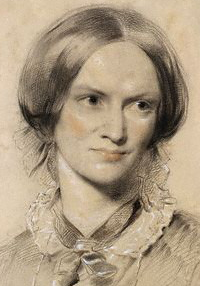 Today is Charlotte Bronte‘s birthday (1816 – 1855). [Charlotte Brontë’s] Shirley: full of characters spouting ideologies, including naturally the author’s own. Toryism, radicalism, rationalized laissez faire, the sexist ideology Charlotte Bronte knew so much about; economic miseries of Orders in Council; the understandable but mistaken tactics of the Luddites, all dated back to 1812 from the 1840’s to provide the hindsight of the Chartist parallels. Other books studying these topics directly might have more & better organized information, but if written in ideological language, however detached or partisan, would have to treat all individuals as case histories. What makes Shirley & other works of fiction irreplaceable is the assimilation of all this to the primary concerns of food (i.e. jobs), sexual love, work & play. This entry was posted in Birthdays, Notebooks, Romance on April 21, 2010 by Michael Happy.